I want to make a switch panel for my car that goes in the ash tray. Its a strange shape close to a kidney bean which is leaving me wondering how I can transfer that shape accurately to be cut? My only current idea is to get the shape on paper, transfer that to a graph paper and then put the points in one at a time around the edges. Is there any better way? Re: how to get random shapes into v-carve? Vcarve is a great program but it is ill-equipped for doing this. It is a semi-advanced thing but with Fusion 360 you can photograph your shape and then trace it and get a good fit. I know it sounds like a lot to learn a new program for this but imo everyone should be using Fusion 360 to put their ideas together and then just using Vcarve for the final mile. In other words, anything you do to learn Fusion for this project will pay dividends later. Are you trying to just get the outline of the shape? or a 3D model of the tray? If you're just looking for an outline--I'd recommend the following: take a photo from directly above the tray, try to get high up above it and zoom in--to reduce distortion from the camera lens. Import this photo into VCarve. Draw on top of the photo using the spline tool. Once you've got the rough shape drawn, you can use node-editing to move points around until you've got a good fit (I realize that these are some tools that you might not have used yet in VCarve--but their documentation does a good job of laying out the details). Once you've got the shape drawn out--you can use the resizing tool to get the scale right -- based on one measurement that you take from the actual tray in the car--like if you measure the tray to be 3" wide--just scale the width of your sketch to 3". I've done this kind of thing before to cut out foam tool holders--I just lay the tools out on a table in the arrangement I want for my toolbox--photograph, trace, scale and cut. The automatic bitmap tracing works if there is a lot of contrast in color for the object you're trying to trace--otherwise, manual tracing works. Does that all sort of make sense? I have gotten so used to doing things in Fusion that I didn't even realize that you can do the same thing in Vcarve. Thanx for pointing that out! I just need the outline of the outside of the tray to lay the plate on top of. I will try the photo import and see what questions it leads to. Thanks for both options. I am so new that I am still learning v-carve and this is the first I have heard of fusion. Thanks for the tip I will check it out. ok that didn't take long. How do I import a photo to v-carve? When I go to the import option it says :vectors, bitmaps, componant/3d model, photo/vcarve. It doesn't matter which one I pic when I go to my photo file it does not have any files for me to select that are able to be imported. You'll want to choose "import bitmap" which will allow you to import a range of different picture types. If you've got an iPhone--like me, your photos will be saved in HEIC format...which is going to be unreadable by vcarve. If you email the photo to yourself, rather than connecting the phone to the computer and copying it--it will be converted to jpeg which can be loaded into vcarve...this is just assuming that you're getting your photos off of your phone...but it has happened to me in the past so I thought I'd mention it! > e? or a 3D model of the tray? > e the width of your sketch to 3". > , manual tracing works. > Does that all sort of make sense? Man I swear I tried to no end to import it 2 weeks ago when I started this and could not get anywhere. Tonight it pulled right up. Now that I have the rough shape that is basically a kidney bean, how do I smooth out the edges, make arcs of the edges? I am sure I saw that somewhere. Thanks again. also on this project I have some really small writing that seems to give me problems. I want to make the base of the panel out of abs, and then make a pocket inside of it to allow me to put an electroluminescent panel inside of it as well as a piece of plexi/acrylic. I was going to paint the back of the plexi and then engrave the words for the switches above each one. When I try to do any of the engraving selections it tells me that open vectors were identified and ignored. What does that mean? ok I got the shape smoothed out, welded together and its cut. This is the first time I have messed with any kind of insert/inlay so I am curious how far off would you back the inner insert from the pocket to get a tight fit, but not needing 30 mins of fine sanding to get them to fit? I cut this insert piece and after some time fine sanding it it fits nice and tight but I am curious if I backed it off a few thousands will it be too much and make a loose fit or what would you recommended? I have another one to cut to go inside of this one and would like to try and figure it out. The black base is abs plastic and the two inner pieces are acrylic if it matters. When you create a VCarve toolpath using a v bit--the program will create the path based on the angle listed in the bit profile. A 90 degree bit has cutting edges that are at a 45 degree angle to the material--so when the bit steps down, it will offset the profile it is cutting inwards by the same amount... creating a 45 degree angled face in the material. A 60 degree bit creates a steeper face, a 15 degree V-Bit creates an even steeper face. When I want to created faces with an arbitrary angle--I'll create a new V-Bit and enter the angle I want (if I wanted a face that was only 1 degree off vertical, I'd say that my vbit was 2 degrees). I set the pass depth to 0.025" (this will control how "stair-stepped" your angled face appears...smaller numbers give a smoother looking face). -- However, when I actually run the cut, I'm going to put a 1/4 straight bit in the router...So, in order to account for the fact that the bottom of my bit does not come to a point (like a vbit) I offset the profile outwards by the radius of my bit (so 1/8" in this case). Then I create another offset further out--try offsetting by the thickness of the material until you get more familiar with this. I then select the two offset profiles, create a VCarving toolpath, and select my "fake" 2 degree VBit tool profile. Set a flat depth equal to the thickness of my material (maybe a little less, so that the part doesn't break loose). This will created a path that steps down slowly and moves outward very slightly with each pass. If this makes any sense at all and sounds like something you'd like to try--I can maybe take a look at your specific file and set it up for you the first time, to give you an idea of how it would work...feel free to post your file here! Today I was finally able to get all the pieces together for the switch panel and I could not be happier. It has 3 pieces that I cut, the base, a trim ring to help hide wiring and the center section around the switches. Since I have never done any inserts/inlays it took a couple of tries to get the numbers right but I could not be happier with the fit and with no adhesives so it can come apart later if I want to switch something but still tight enough you can hold it upside down and shake it and nothing falls out. I have to flex the base a bit but then the inserts drop in and hold tight. 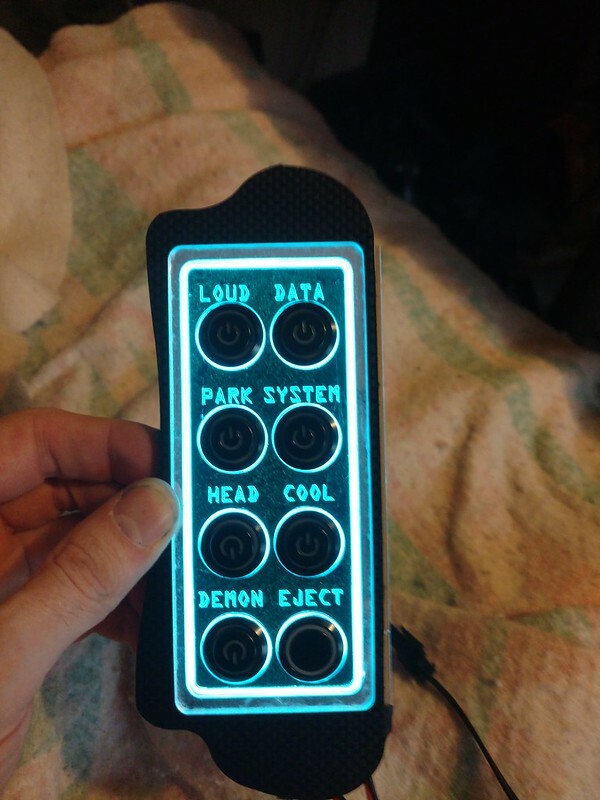 Very cool---but what kind of device does this array of buttons control?? Edit: My girlfriend says she hopes that its a control panel for a hot-tub! Edited 1 time(s). Last edit at 01/06/2019 06:55PM by Brian Owen, ShopBot.